Designed with you, just for you! 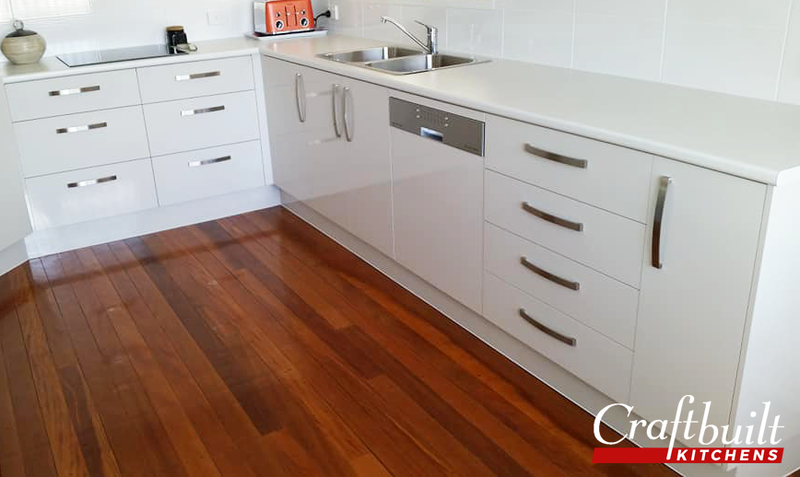 For over 40 years, Craftbuilt Kitchens has been supplying quality kitchens, benchtops and bathrooms. We help bring dream kitchens and baths to life. With such experience and knowledge, our clients can attest to that! This company has an excellent team of tradesmen. They turn up on time and are highly skilled. The end product is terrific. We’re very happy with our new kitchen, our 2nd Craftbuilt Kitchen. 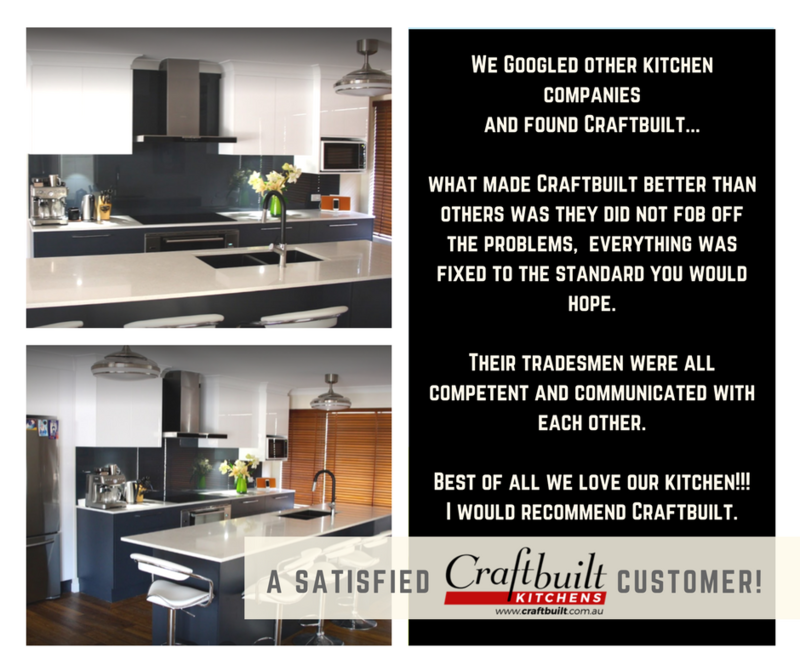 From the moment we decided on Craftbuilt we found a very dedicated person from the design right through to the tradesmen who worked on our kitchen. Happy helpful caring and passionate about every detail. Kitchen is just beautiful. All the work went along pretty smoothly, now we have a fresh modern kitchen. Thanks to everyone concerned! Loved my Craftbuilt kitchen so much I got my bathroom done too! Fantastic job with special thanks to Sharon and Paul for their awesome work. highly recommend them. I am very happy with the design & results. Woul totally recommend to anyone. From start to finish, our Craftbuilt Kitchens staff and tradies were always on time, neat and always cleaned up after work. We thoroughly recommend Craftbuilt Kitchens. Craftbuilt are great to deal with from designing to install. Everything is organised for you so all you have to do is enjoy your new kitchen . I’m excited to be using them for my ensuite renovation next . Great advice, workmanship and options. Sue was extremely helpful in aiding us to make our selection with great ideas and patience. She happily worked into the evening with us when we missed our appointment. A great selection overall of both worktops and cabinets. The work was carried out efficiently, to a very high standard and on time. 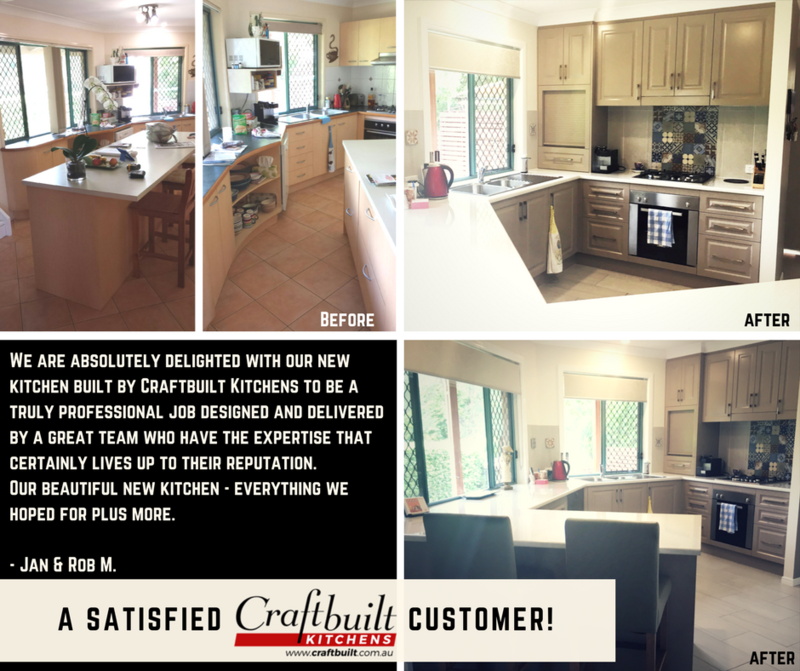 We would totally recommend Craftbuilt Kitchens and their crew and we ourselves will be using them in the future for our other homes. Good company to deal with. Trades always on time, polite and helpful. Love my new kitchen. Overall very happy with quality, installation and service. The whole process to renovate my kitchen has been a breeze thanks to the team at Craftbuilt. From start to finish the team has been genuinely interested in ensuring that I was happy with every element of the design and installation. 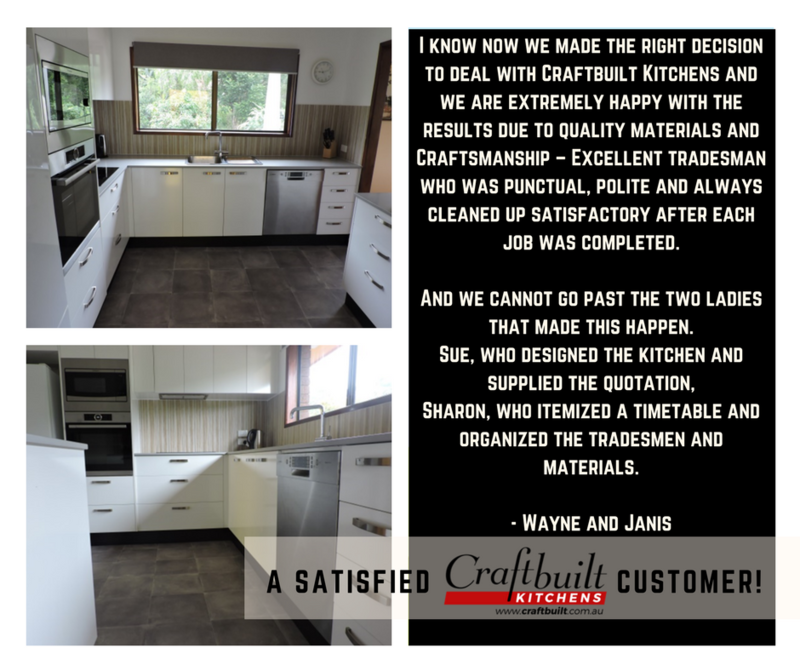 The trades people they used were high quality, professional, and efficient at their various tasks.I would recommend Craftbuilt to anyone wanting an attention to detail kitchen renovation. I purchased the Kleenmaid undermounted rangehood and this was a good decision. It has reclaimed space compared to what I had before and is much neater than having a rangehood that pulls out from under the cupboard. Lovely to have my new kitchen island. Totally satisfied with it. Have 5 rental properties which may need updating in the future. Sue your kitchen designer is amazing. Explains things very well. Comes up with multiple designs. She is an asset to the Craftbuilt Kitchen company. I have also recommended the company to friends looking to update or replace their kitchen. My advice would be… Choose Craftbuilt once you have your design sorted, sit back, put your feet up and relax. Craftbuilt will do the rest without stress. An amazing kitchen done by an amazing team. All the trades arrived on time, very polite, friendly, hard workers and tidy. They all worked well as a team. So everything ran like clock work. Awesome job. Thank you guys! And thank you to everyone at Craftbuilt for our amazing kitchen that we are extremely happy with. We highly recommend you. Quality and service was excellent. Installation was delayed a couple of times due to delays with the cabinet maker. This became very frustrating at the time but I appreciated Craftbuilt’s efforts to resolve and ensure high quality products. I can’t fault the service. My only regret was not taking more time to peruse more fully the fittings on offer and look around for better non-slip flooring. The tradies were all very good, hard working, efficient and on time!! It was a great job and we are very pleased with the kitchen. The whole job ran like clockwork and communication throughout the process was excellent! Thanks!!! I just want to thank you for the great job you have done installing my new kitchen. I am absolutely thrilled with the result and am so pleased I decided to use your company. When I initially came to your showroom to see the quality of your kitchens I did assume that you would be out of my price range, as the quality looked so good. I later decided to ring Craftbuilt anyway and have a chat, thinking that I had nothing to loose in making contact, while all the time thinking that you would be too expensive for my budget. After getting Sue out I was pleasantly surprised that your final figure which was reasonable and very comparable with some other quotes that I had received. I knew that if I chose your company I was going to get a new kitchen that looked more expensive than what I had paid. What may have been classed as extras with other quotes were included as standard with Craftbuilt. Now I have a kitchen that I love, everyone who comes to visit comments on how lovely it is. I was also impressed on how smoothly the installation went, obviously that was thanks to Sharon, who according to all the traddies that came out for my job commented on her being such a great Project Manager. All of guys that were part of the dismantling, installation, plumber, electrical and tiler team, were all so lovely it was a pleasure to have them in my home. I am happy to recommend Craftbuilt to anyone who is looking to replace their old kitchen. In fact I have already done so. So thank you Craftbuilt Team for making my kitchen installation as smooth and seamless as possible. 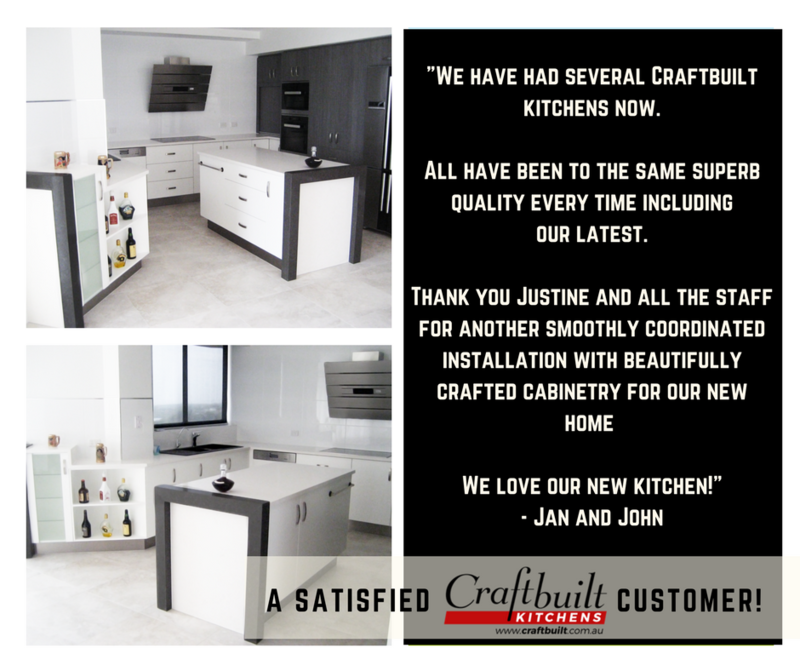 We used Craftbuilt Kitchens and are more than happy to say that the results are fabulous. From conception to completion, the staff made sure we were fully informed and their team of trades were always on time and onboard with the project plan timetable. Nothing was too much trouble and each step of the way, the tradesmen worked so neatly and efficiently that our build seemed to be done before knew it! Now we show off our kitchen and can’t recommend Craftbuilt Kitchens highly enough. All I keep saying is “WOW”. Thank you all so much for our awesome kitchen. Every one at Craftbuilt and trades did a fantastic job of giving us a kitchen that suits our needs and looks amazing, I couldn’t be happier. But most of all no stress at all. And everyone, again including trades, are so friendly and helpful. Thank you all again. WOW! You have left us speechless, we love our new kitchen. 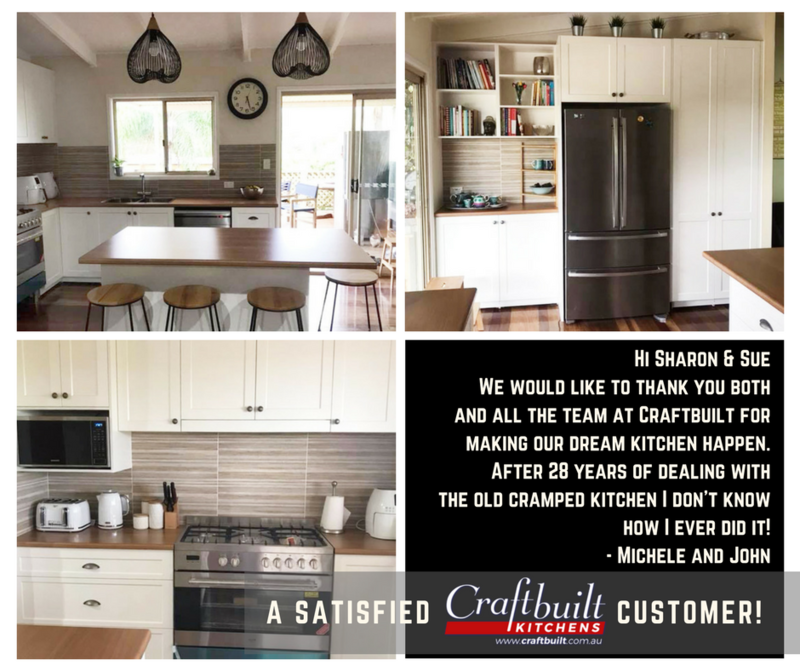 Thank you to the entire Craftbuilt team but especially to Sue, Sharon and Paul for all your hard work in designing a kitchen that works for us, trouble shooting/sorting out the hiccups at no fault of yours and ensuring the finish to our kitchen was perfect. All of the staff/trades were professional,friendly and showed up on time. I would highly recommend your family business to anyone!! If you are looking for a great quality kitchen and fantastic customer service, look no further. My new kitchen is custom made, is of brilliant quality and looks amazing, but what stood out for me most was dealing with the people at Craftbuilt Kitchens. From the first point of contact with Belinda on the phone, to designing the kitchen with Sue, to dealing with Sharon and Deb during the process, they all have been amazing to work with. Belinda, ringing around getting quotes, you stood out from everyone else. You were very friendly and took the time to talk to me to find out what I needed and rang me back after you’d spoke to the builder in regards to removing a wall. I can assure you I did not receive the same friendly and helpful response at other places. It really was because of you that I ended up with Craftbuilt Kitchens. Sue, your design was the best design out of all of them. I loved your idea about moving the stove and when we found out we couldn’t remove that wall, I loved the breakfast bar alternative you came up with. What I appreciated most is that you put together the quote in the same day that we met up, because you knew I was flying home that evening. Others took days to get back to me and 1 supplier even took 2 weeks. I really felt looked after by you. Sharon & Deb, thank you for your friendly service. Sharon, you are one funny girl. Thanks for the laughs! All these people obviously love what they do and it shows in dealing with them. Renovating my kitchen became a fun experience instead of a stressful one. I highly recommend Craftbuilt Kitchens. I met with Justine from Craftbuilt kitchens on the recommendation of a friend & I’m very glad I did. I found Justine & her team to be very friendly, informative & helpful, even a last minute change to my benchtop was no problem, only incurring a small fee. The team of installers were as unintrusive as is possible when someone is renovating in your home. The timetable provided for my reno was great & helped immensely when organising my days. The attention to detail by the whole team was very much appreciated. I am extremely happy with my final product & will & have recommended Craftbuilt to other people. Very pleased with the kitchen they created for us and the customer service we received to make sure we got our dream kitchen. Not an easy design as our kitchen was relocating to another room. Justine was wonderful at troubleshooting and presenting lots of ideas to ensure we could incorporate all the features we wanted. Not only is the kitchen high quality, but the after care service has been wonderful. From the very start of our new kitchen build to the install, we couldn’t fault Craftbuilt Kitchens. Kitchen designer Sue is by far the most valuable asset to their team. She was incredibly patient and provided practical hints in our extensive design meetings while doing her best to keep us within budget. Sharon did a great job scheduling the install and everything ran smoothy. Couldn’t fault our experience and absolutely love our new kitchen. Thank you!!! The process was so easy, with great advice from Sue, excellent scheduling from Sharon, and assistance from Belinda. We received several quotes. Difference in price, product, value for money was not only ridiculous but confusing. We had quotes from renovators to kitchen specialists. Ideas went from renovating kitchen to whole house. Prices varied from $16000 to $145000 yet all we wanted was our kitchen renewed. We wanted to open up our small kitchen family area, supply all new appliances and have someone design a new kitchen around our needs. Craftbuilt ticked all boxes the first-time senior kitchen consultant Sue walked in our door. Sue is a good listener combining her experience with our ideas rather than trying to sell us something we didn’t need or want. Like anything there were hiccups along way but solving them was never a problem in consultation with us. Their tradesmen were kitchen specialists, courteous and professional. Obviously, any renovation causes a degree of inconvenience for occupants such as water or electricity disconnections but these were certainly kept to a minimum always in consultation with us. They talk about results speaking for themselves and pictures telling a story. We have no hesitation recommending Craftbuilt Kitchens. Justine the owner of the business came to my home and designed the layout of my kitchen. Having a small house as well as enjoying entertaining, I needed to create a kitchen which would give me maximum bench space and create room for entertaining. Jay performed a miracle and came up with ideas I would have never considered. From removing walls to extending windows to my deck which has just created such a flow on effect throughout the entertaining area in my home. She even sneaked in a built in wine rack and ample of cupboard space. I have ended with up with a very classy looking kitchen and 10 years on my kitchen is still looks as new. I guess that must come down to the quality of her product. Thanks Craftbuilt Kitchen. If we are asked by a prospective client of Craftbuilt we would be happy to explain the quality and profession workmanship. Very happy with the professional & caring approach from both Justine & Sue. Installation generally went well & any problems were dealt with quickly & efficiently. This is the second Craftbuilt Kitchen we have had. We sadly had to leave the first behind in the house we sold, so the only thing for it was to Reno our new house with a new Craftbuilt Kitchen! The whole experience was amazing from the designer to the builder to the guys who finished everything off. The attention to detail is fabulous and everyone admires our beautiful new kitchen. Thank you so much to the team at Craftbuilt!! Did I mention I love my new, very workable, gorgeous new Craftbuilt Kitchen! My parents had their kitchen renovated by Craftbuilt in 2013, and changed it from a dark and dated kitchen to a light, airy, user friendly space. After my father passed away in 2015, mum decided to sell the family home. Everyone who came through during the open house commented on how amazing the kitchen was, and the house sold after only two weeks on the market. I have no doubt that the kitchen helped to sell the house. Mum loved the kitchen so much that she is now using Craftbuilt for the kitchen renovation at her new (downsized) home. Sue has been so helpful (both times) with making suggestions and finding solutions that work for the space. Thank you for making the renovation process so easy! 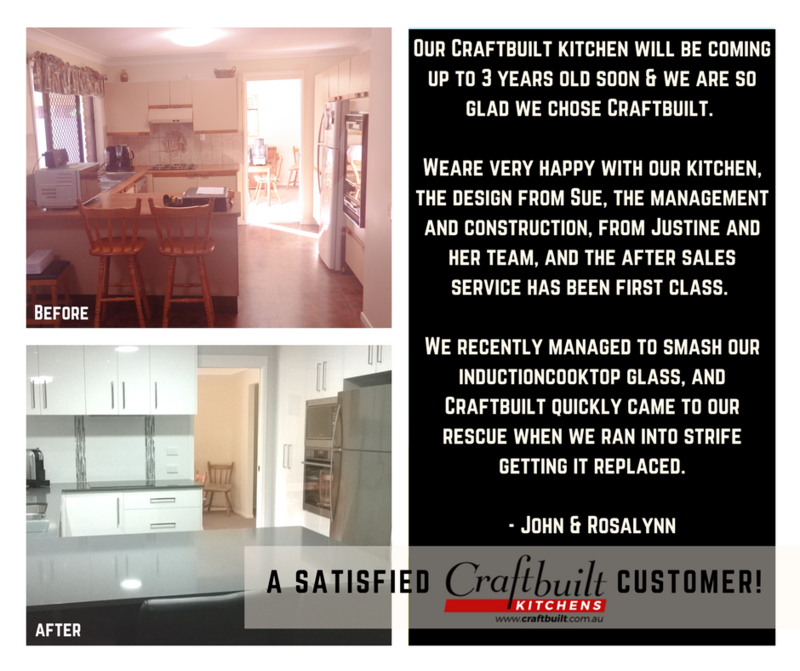 When it was time to update our kitchen we went back to Craftbuilt who had installed our previous one thirty years earlier. We were well pleased then and even happier this time. Any customer should feel the same. They listen and suggest and have a showroom to demonstrate – and so many things improve over the years. Our new kitchen is a joy to be, and work, in. The experience and dedication of the company and all staff is apparent in their work. They are friendly and respond well to any suggestions to produce great results. They deserve all praise. From the very start of our new kitchen build to the install, we couldn’t fault Craftbuilt Kitchens. Kitchen designer Sue is by far the most valuable asset to their team. She was incredibly patient and provided practical hints in our extensive design meetings while doing her best to keep us within budget. Sharon did a great job scheduling the install and everything ran smoothy. Couldn’t fault our experience and absolutely love our new kitchen. Thank you!!! Three years and counting, with these clients! Craftbuilt were awesome and nothing was too much trouble, all my questions were answered promptly, communication was great and the quality of workmanship is second to none. I cannot review Belinda from Craftbuilt high enough. She spent an extensive amount of time in the showroom taking me through all the products we had been looking to purchase for our new home. We are doing all our purchases through there and hope that anyone on the hunt for quality kitchen appliances and fit outs take the time to pop in, you’ll be glad you did. Thanks Belinda, you’re a star (or five:)! Extremely happy with my new kitchen. Sue was great to work with in designing the space as it was a big change with substantial building works needed. All the tradesman provided by Craftbuilt were skilled, punctual and flexible when needed. I have and will continue to recommend Craftbuilt for the excellence. I know now we made the right decision to deal with Craftbuilt Kitchens and we are extremely happy with the results due to quality materials and Craftsmanship. All have been to the same superb quality every time including our latest. Our beautiful new kitchen – everything we hoped for plus more. 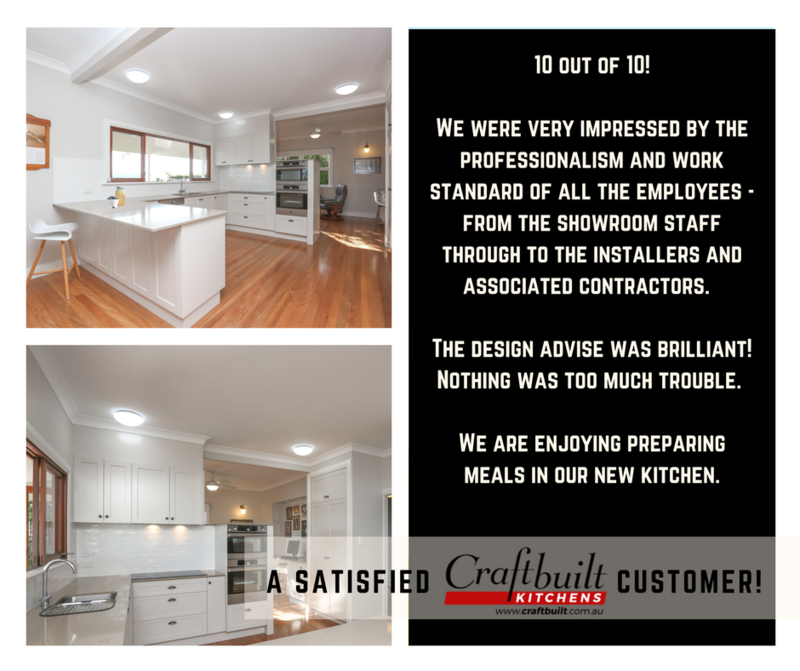 What made Craftbuilt better than others was they did not fob off the problems, everything was fixed to the standard you would hope… Best of all we love our kitchen!!! I would recommend Craftbuilt. We have even recommended Craftbuilt to several of our friends and some of them have also had a second and third kitchen themselves. We simply can’t recommend Craftbuilt highly enough. We also believe that our beautiful cabinetry became great assets when it came to selling each of our homes. I have delayed this testimonial until I have had a few weeks to use the finished product – it’s great. This is my third Craftbuilt kitchen – that should say it all. Craftbuilt were a pleasure to work with. Well done. I found Sue a very professional sales person, with good ideas and the reason WHY for her suggestions but taking into consideration it was my kitchen and I must be happy with the design. She was always willing to see me again and again while I was making up my mind on final design. It was more expensive than I originally thought and trying to cut costs by omitting things like self closing drawers and perhaps the stone benchtops I was compromising a great kitchen by actually cheapening the whole design that made it a great kitchen. Hence I went back to the original concept – and said hang the expense – one only lives once. I am truly thrilled with the outcome and would recommend Craftbuilt Kitchens. I was also impressed that trades people were organised and I didn’t have to organise and source them. We are very happy with our new kitchen, Justine made some great suggestions to our original plan and made sure that she worked with our vision and what we wanted. We had a minor issue after installation and it was dealt with immediately in a very professional manner. The installation guys were polite, on time and done a great job. I would happily recommend Craftbuilt Kitchens. Thank you Sue and the amazing team of professionals! As you know, I was very nervous about the journey to a new kitchen!! Sue & Nigel were so helpful and encouraging, together we have built my dream kitchen and it is a dream to work in. A special thanks to the tradesmen including Sebastian, Rene, Darryl, Sam and the amazing stone masons. This has been a nerve-racking yet very special and exciting journey that has gone so smoothly (despite a couple of minor hiccups that were soon fixed). It was amazing to watch the kitchen take place in front of my eyes and see the materials and colours coming together better than I could have imagined. I look forward to our next project together! Thank you for my great kitchen, I just love it!! We found all staff to be very friendly & helpful – 10/10! Very happy with end Result! Impressed with apprentice Jordan who came up and introduced himself and shook hands-the only tradie to do so. Thanks to long suffering Sue – as there were so many colours to choose from for the counter tops and cabinets it took an age to make up my mind. Happy with end result. Thanks to Justine for double checking measurements – all good. Very pleased with my kitchen and the overall service and help from Sue & Justine. So glad that we partnered on this project. Excellent outcome, thank you! From our first visit to the Craftbuilt Showroom through to completion of our stunning kitchen, the Craftbuilt team were very impressive and maintained our confidence. We saw the value in having Sue guide us with practicalities in design and colour etc. We were happy with all areas. I am absolutely thrilled with my new Craftbuilt kitchen. With only a modest area available, your designer was able to create a WOW! factor which I could not have imagined. I love seeing the expression of delight and surprise on the faces of family & friends when they see the transformation from tired old cabinets to the new Craftbuilt standard of quality and ‘sparkle’. Craftbuilt was recommended to me by my brother, who on two occasions used your company and was very impressed with quality of workmanship and service. Your attention to complete satisfaction for your clients was obvious, starting with our introduction to the Manager, Justine and very helpful Designer, Sharon and of course your very talented tradespeople and office staff. My very sincere thanks. 10/10. I thought that all of the tradespeople were exceptional and very professional, clean & tidy – what a delight it was to have them in my home. The girls at Reception were always great, ready to answer any questions. I am absolutely loving the plum colour of my feature laminate, I’ve had nothing but great comments. I would highly recommend you and your team to anyone that is interested, I have a friend from work coming to have a look at the real deal – not just the photos. Cheers to you all. We are very pleased with the willingness of Craftbuilt to meet our time constraints, the efficiency with which the various tradesmen did their work on the day requested and the high quality of the workmanship of the finished product. 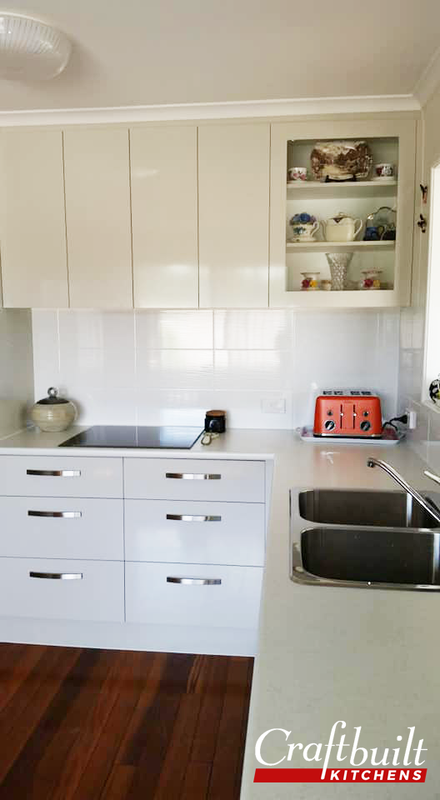 When made aware of one small fault in the surface of a benchtop, the company was even prepared to replace the whole cupboard; a move which we believed to be quite unnecessary. We highly recommend Craftbuilt for others seeking an updated kitchen. 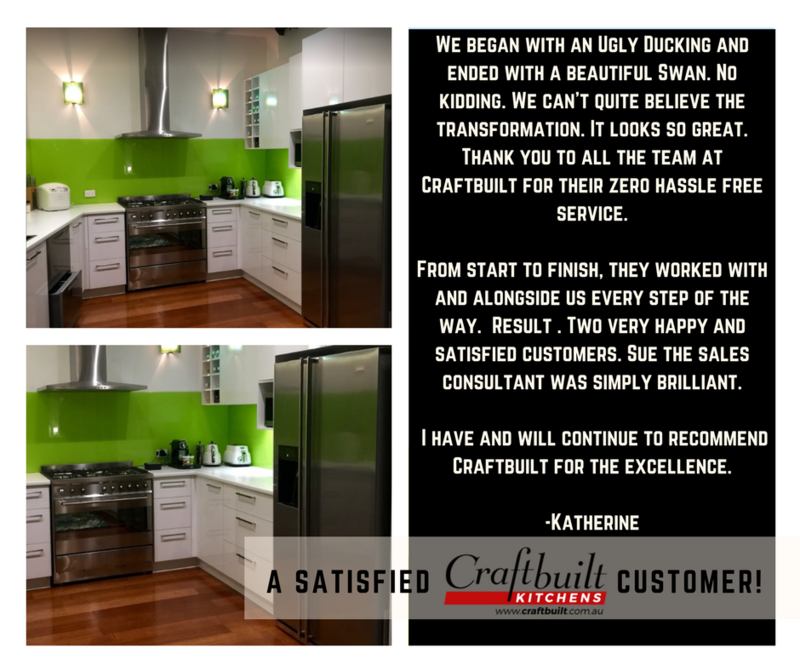 Craftbuilt gave us what we wanted, a great kitchen, functional, stylish and something that would last for years, top quality cabinets and the tradespeople were better than most with excellent finishes. My wife’s happy and you can’t put a price on that! Can our writings improve on what we have said………..we don’t think so! However, maintaining the status quo will always be a challenge. But to Craftbuilt; challenge, communication and the best trades work, from woe to go is a very successful combination. 10/10. Professional in every way whilst being friendly, helpful, warm & caring. It was wonderful to deal with a company whose staff – Admin & Trades – all showed some of that old fashioned respect that is sadly missing in today’s society. Not only was the job well done but each member of the team showed decency and respect in every action they took. It was a pleasure to work with and be involved in a Craftbuilt commitment. I thank you for treating me with the kindness we all so desperately seek. Very very happy with the final result after all defects were attended to – Craftbuilt addressed all concerns. I love my new kitchen. I had been considering my new kitchen design for a number of years before I was ready to commit to the expense. So choosing a company was a huge and most important fact in my decision. I explored a number of options as to how I would find a reliable company as well as someone who would design me a practical kitchen that would also look great – and fit into my very awkward space. There were a number of factors to address as the whole existing kitchen was all wrong and was a waste of valuable space. I had some firm ideas but needed an experienced, creative designer in kitchen planning to answer all my many queries and ultimately work with me to come up with the best plan for practical needs, use of space and make it look great. “ENTER’ Sharon – I say it like this because from the moment I met my “would be” kitchen designer, her bubbliness and enthusiasm was exciting. I didn’t make it easy for her but her natural passion and true passion for her designing was infectious. We worked together over the following weeks until not only did she deliver but more importantly, I was happy with the final design! – We had ticked all the boxes together – Practicality, Design and fantastic finishes that look amazing. Everyone at Craftbuilt including the installers and tradesmen went above & beyond in all aspects of service and professionalism. I now have a beautiful space for me, my hubby and teenage boys! A very good Company to deal with. Consultation process was very good. Did not feel pressured in any way throughout the entire process. My kitchen has gone from a dated, badly designed space to being modern & functional. Thanks to Sharon for the amazing design and to Kelly and the boys for the great workmanship and installation. It was a pleasure to use a company that has more than lived up to its promises. We are very happy with the quality of our new kitchen and the attention to detail shown. All the tradespeople very very punctual, polite and professional. The only problem we’ve had was that the canopy installation leaked badly down into our stove when it rained. We rang John (the canopy installer) the next day and to his credit he came out to fix it within a few hours and we haven’t had any leaks since.’ Thank you all for our beautiful kitchen. We would like to make special mention regarding Sue – she was so professional from beginning to end; unflappable in a mini crisis, always friendly & helpful, caring, flexible, reliable, understanding!! Thank you Sue. 10/10. We are both very happy with the look and functionality of our new kitchen. 10/10. I found the company and its employees very helpful, friendly and efficient. I would like to make a particular mention of the installers, Mark and his assistant. Mark is a perfectionist which I was very pleased to see. 10/10. Everyone on staff – Bev, Sue, Sharon & boys who installed were friendly and keen to do a great job. Tiler Rene was brilliant. Many thanks. 10/10. Impressed by friendly professionalism of all we had contact with. 10/10. Good quality, good finish. We are very happy with our kitchen. Thank you! We found Craftbuilt to be a highly professional and extremely organised company. The itinerary given to us for each step of the installation was spot on which made the transition from old to new kitchen very easy – and we had 4 house guests in the middle of all this! We would highly recommend the ‘team’ for any kitchen design and installation. As a practicing architect of 45 years, it was rewarding to work with a contractor that not only set a program but adhered to it. With regular updates during the course of the work meant that at no time were there changes, with all sub-trades performing & coordinating perfectly. I was in awe of your Craftbuilt kitchen installers as they worked so professionally, quietly progressing along with their work and left areas clean and tidy. Contractors were pleasant and friendly. Overall, it started with Sue, then Sharon and Beverley that made it all smoothly accepting this wonderful new and big change into my life. Thanking you. Ahh. Both Pam & I were impressed by the flow of info to us by Nigel on what happens next. All tradies were fantastic as one would assume that you would not employ poor tradesmen. All Craftbuilt staff and contractors were unfailingly cheerful, helpful and professional and the quality of the workmanship is of a very high standard. I LOVE my new kitchen. Excellent experience through the build but also the design consultation with Sue was exactly what we needed to combine our thoughts with Sue’s experience. We’ve recently renovated our kitchen and laundry and chose Craftbuilt to do the work. The quality of materials, finish and service from the Craftbuilt team has been great! All projects have issues but the measure of a great company is how well they address issues that may arise. Craftbuilt handled problems well and now we have a bespoke kitchen and laundry of which we can all be rightly proud! Thanks, guys. Well done. Of all the house renovations we have had over the years, this was by far the smoothest and hassle-free we have ever had. Top quality service from everyone concerned. The new kitchen is fabulous. Thank you Craftbuilt, we are so very pleased with your product and workmanship. We would like to say how friendly Sharon and the team have been to us. Many thanks 🙂 Our kitchen looks great – we are extremely happy with the end result. All aspects of Craftbuilt Kitchens work was professionally carried out and to an exceptionally high standard. Just like to thank you all for great service from everyone who took part. All did a great job, just so happy with our new kitchen. Merry Christmas to everyone at Craftbuilt. The end to end process from sales to completion was undertaken in a professional and seamless manner. As a person who works in project management, I was most impressed with the adherence to schedules by all involved and the faultless installation without any major adjustments or return to workshop. We are happy to recommend your company to anyone. Sue was great to deal with, very helpful. The process was nice and easy, even the few little fix-ups at the end from the factory boys was handled efficiently – thank you. Philip & I are very pleased with the new kitchen, very happy with Sue and all your team members are very friendly and efficient. Mark & his colleague did a very good job during the installation. Well done to all of them, they are an asset to Craftbuilt Kitchens. Big credit to you all. We have been very impressed with the planning process along with the combination of their professional approach in the installation of our kitchen. Our installers worked incredibly hard all day into the early hours of the evening – very impressive – all with good humour too! The tradesmen did an excellent job too and were very approachable. Sue, our consultant, was brilliant and creative in helping us re-design the layout. Nigel explained things very well to us and was most attentive when we made any enquiries. Thanks have to go to all those in the factory who built our kitchen. Great work. We are thrilled with our kitchen. Front Desk ladies were also very helpful and ready to listen. Everyone is most professional in their specific areas. A great outcome for us! We could not be more happy with our beautiful new kitchen. Thank you for a wonderful professional job. My plumber said the accuracy of the cuts and holes for plumbing were excellent and wanted his comments passed onto Ashley. Sue was particularly helpful. Very happy with the end result. The kitchen looks fantastic. Very professional company – efficient & reliable. Work done in one day as stated. Very happy with the result and I would recommend Craftbuilt to other people. As a repeat Craftbuilt client, my previous kitchen was a Craftbuilt kitchen in 1990, I am delighted with the kitchen & inclusions and I particularly love the drawers. Thanks Sue, for your advice, Nigel for project management and Mark for installation. Great job. From the 1st time we visited the displays Sharon, Sue, Nigel & the team were thoroughly professional, understanding of our requirements and flexible in their responses. They met all the deadlines and the result is excellent. We would recommend Craftbuilt to anyone seeking a new kitchen. I love the design & quality of my new kitchen – a big thank you to you Sue. Thank you for my new laundry, everything is exactly as was stated in the quote – love it. Everyone from my initial contact with your receptionist, then on to Sue, Nigel, the two young boys, Nick, Rene & Darryl could not have been more friendly & helpful. 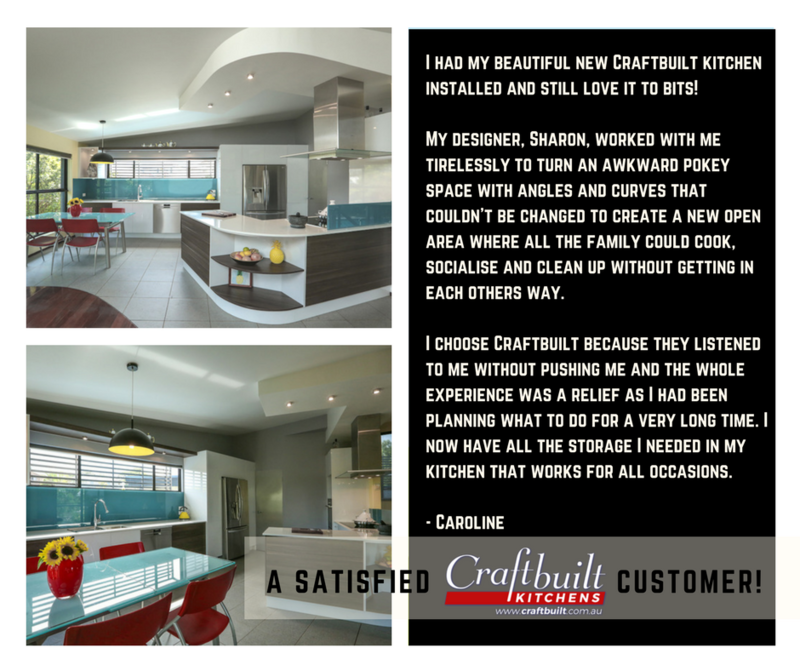 If we know of someone who needs a new kitchen, I will not hesitate to recommend Craftbuilt. It was a pleasure to have Mark & Jack do the installation; Rene’s tiling is superb; Nigel was so thorough and instilled confidence & Greg was so quick and skilled with the pantry removal. Sue was so insightful with her design. Sheila was so helpful & knowledgeable and Bev so professional. Thank you all so much, I am absolutely thrilled with my new kitchen & can’t stop staring at it! We have been most impressed with Craftbuilt from the beginning to the end. Nothing was ever too much trouble and any problems encountered were rectified quickly. Our kitchen functions well and looks beautiful. Thanks to Craftbuilt! We are very happy with our kitchen installation. Craftbuilt went out of their way to get our kitchen installed before Xmas 2011 and the install went without a hitch on the day. Everything happened on time and quickly, a very positive kitchen experience. Great advice and service. Sue was excellent, the design she came up with was exactly what I wanted & was really helpful with suggesting where to put items. We love our new kitchen, your service was great and exceeded our expectations. We found that the expert advice with the design and quality of build plus the very friendly and obliging tradesmen made the whole experience somewhat easier resulting in a fabulous kitchen. We would not hesitate to recommend Craftbuilt Kitchens. I am very happy with the end result. But I must say for someone with cleaning OCD it’s not the most fun to go through! I guess that’s just renovations. I love how it looks! Thanks. Each of the tradespeople were meticulous. I have no hesitation in recommending Craftbuilt to anyone. They are a professional team who take pride in their work. We’re really happy with total team and in particular Mark and his attention to detail, professionalism and customer care – excellent! Sue was great to deal with; good ideas, listened to our ideas and was great with our rampant 5 year old. Thanks to the team. Excellent service. The on-site trades people were prompt, tidy, efficient and pleasant to deal with. We were impressed with them. We were kept informed by Liam & Nigel what was happening – which is important. Our daughter wants you to open in Townsville! Thank you Craftbuilt. The co-operation and assistance of your staff was absolutely first rate and the new kitchen is first rate also. All staff were very professional and helpful – Sue, Nigel, Mark & his team, Greg (the carpenter) and Rene (the tiler). Thank you very much. From beginning to end it was brilliant. Keep it up. I have heard absolute horror stories from friends about their experiences from other kitchen suppliers. My brother’s kitchen took 8 weeks to install after the start date and yes, we will be recommending Craftbuilt Kitchens. Life gets busy and we haven’t had time to thank you. Thank you sincerely! I was very happy with all the people involved. So thank you very much. Initially what grabbed me was our home visit from Sue. Her input into design was very helpful and enabled me to visualize our new kitchen. Nigel and the boys were friendly, professional and able to answer all my questions. They arrived as per schedule and cleaned up after themselves. I’m very happy with the finished product; lots of space and easy access. It certainly adds value to our home. Thank you. We really wanted to send you this to let you know how thrilled we are with our beautiful new kitchen. Everything has been done exactly as described and the level of work is awesome. The tradesmen that you organised for us were professional, neat and above all really, really friendly! I love, love, love my Caesarstone benchtopsand am so glad we spent the extra money and got the best quality. We wouldn’t change a thing and I am having so much fun cooking now! Thank you so much for a job well done. We’ll know where to come when we are in the market for another kitchen in the future. Just a few words to express our thanks for the professional way that the contract for the kitchen was carried out by Craftbuilt. Our thanks to your courteous staff, Sue, Nigel, Liam in the planning and manufacturing stages. Mark and offsdier for their meticulous installation. Jason from Willis Stone, also Danny the plumber and Darryl the electrician. We would have no hesitation in recommending Craftbuilt to any other person wishing to renew their kitchen. I would like to praise the workmanship and co-operation of your installers Mark and Jack who installed our kitchen recently. They always arrived on time, were courteous and very tidy. They are an asset to your business. Pass on my thanks for a job well done. To all the team at Craftbuilt, what can we say? We cannot find enough complimentary words to express our satisfaction and gratitude for the magnificent kitchen which was designed supplied and installed by your company. Right from the first contact with Bev in the Showroom we felt completely at ease. Sue (the designer) is an absolute treasure and her final design for our kitchen is perfect. Many thanks to Nigel, Mark and Jordi for the very professional manner in which they carried out the removal of the old and installation of the new in one day. Not only are they professional but gentlemen as well as they refused to accept a cash gratuity which we offered, stating that they are paid by Craftbuilt to do a good job, and our satisfaction is what they strived for. Also our thanks to Liam and the factory staff for a job well done. As well we include Darryl (the electrician) and Greg (the carpenter) for their valuable contributions to the finished product. 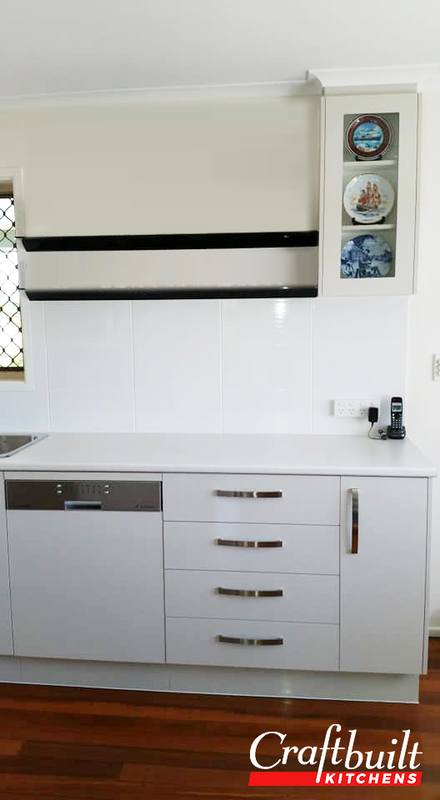 It would be remiss of us if we didn’t mention your sub trades, Willis Bros (stone benchtop) and Voodoo Glass (Glass Splashback) as the attention to detail by both companies was first class. Finally we are very, very happy with our new kitchen and we would have no hesitation in recommending Craftbuilt Kitchens to anyone contemplating the replacement of an old kitchen or the installation in a new home. Once again thank you Craftbuilt. We would like to say thank you for our magnificent kitchen and professional way which you do business. From the time we walked into the showroom and spoke to Bev to the time the kitchen was complete, we dealt with caring and very professional people. We would like to thank Nigel, Mark, Jordi for installing the kitchen in a day. Thanks guys. Your tradespeople Rene (tiling), Daryl (electrician), Ross (Plumber) and Nic (Plasterer) Thanks. A very special thankyou to Sue (you are a gem). Your design is great, and the way you do your job is outstanding. You go that extra mile and really care for your clients. Thank you!! As a company you are AAA+ and we would recommend you to anyone needing a kitchen. Thank you for everything I am impressed. It is an impressive well run organisation/company. I would love to especially praise the boys who worked on my kitchen… They were very polite, awesome attitudes, workmanship. TEN OUT OF TEN. This was not an easy job to do at all. One Hundred percent no damage or scratches anywhere. The neutral colour looks a Million Dollars. Once again thank you very much, I am very happy. To Sue, Bev, Nigel, Rene and everyone at Craftbuilt, this is just to say thank you very much for the efforty and fabulous job that your combined effort has taken to produce our lovely kitchen. It has definitley lightened and brightened quite an otherwise dull and drab room. Please feel free to drop my name and our phone number is you would like to show potential clients a sample of your excellent work. Just wanted to thank the fabulous team at Craftbuilt Kitchens! Your customer service was fantastic and I love my new Kitchen. Thank-you for making it so easy with your wide selection and great advice. Much appreciated. I just wanted to let you know the kitchen is in and I LOVE IT! The colours are absolutely perfect and your design fits in with the rest of the house beautifully. Mark and Mick were fantastic too, they are such nice guys and were so respectful of my timber floors, walls just everything. 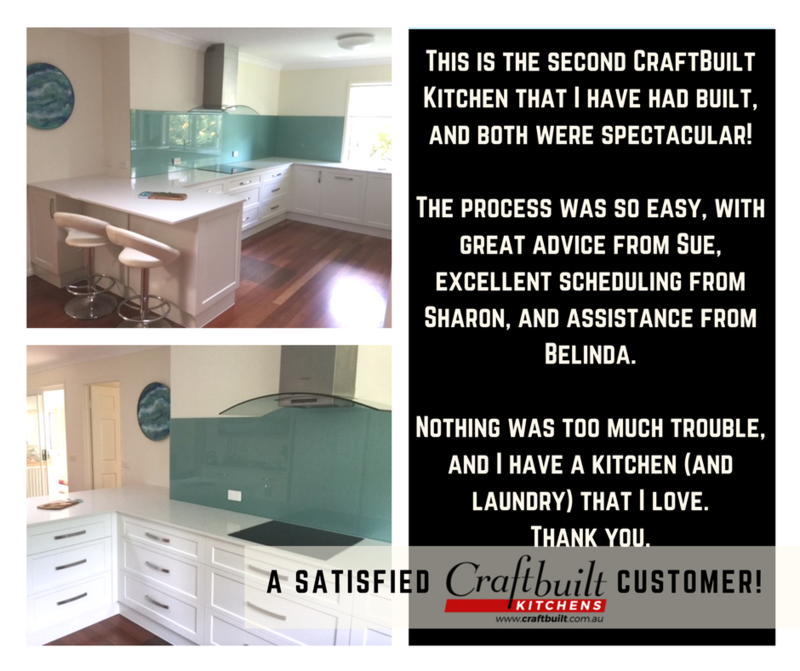 They did an amazing job and I am so pleased with the results… I can’t say thank you enough, it has been an absolute pleasure to deal with everyone at Craftbuilt and I am going to enjoy every second of my new kitchen. Sue Whittred came and turned my dark, horrible and dated kitchen into something that is modern, functional, bright and roomy. She listened to what I wanted and made some fabulous suggestions that really worked. All the people at Craftbuilt, from the staff in the showroom, to Bob who came and check/measured and made sure all my appliances/containers etc would fit perfectly on my new shelves and in my new wonderful pull out drawers, to the installers and the efficient young man who came out and adjusted a drawer that wasn’t quite right. Nothing was a problem to them, even when I changed a couple of things around! 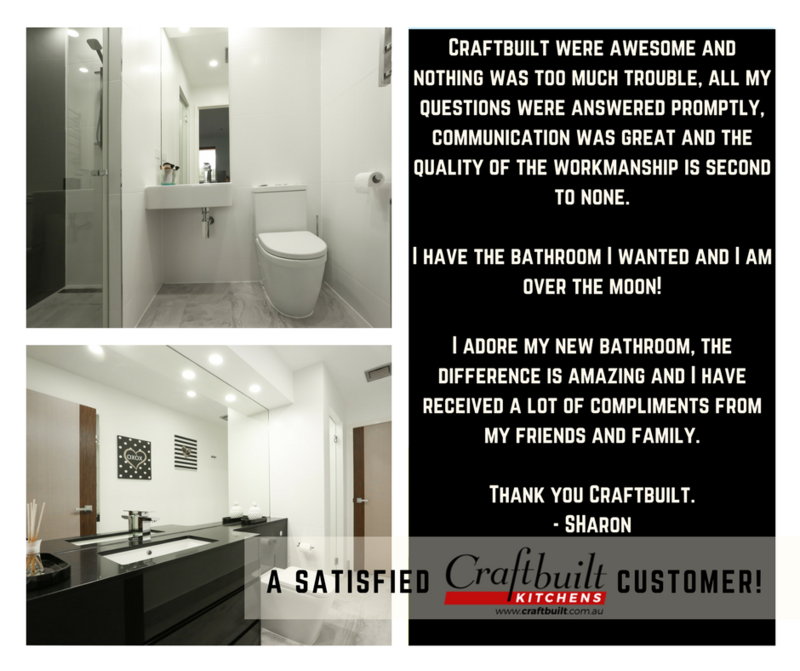 I have no hesitation in recommending Craftbuilt… Man the installation crew certainly works hard but efficiently as a team once they arrive and get started! Just a few items of feedback: there is plenty of room now to put everything; the space has been utilized very effectively; very friendly customer service; easy to understand quote; flexible design with room for changes; showroom well presented with modern concepts; able to decide in own time, little pressure on customer; willingness to answer questions about details. All the people involved from taking away the old, putting in the new, also the electrician, plumber and the tiler all did a very professional job. We would recommend Craftbuilt to everyone. We wish to express our sincere thanks for your prompt response to our kitchen request, regarding the re-positioning of the island. Your installation team rectified the situation within a matter of 15-20 minutes and our island is now in its intended location. We found your assistance in colour selection, designs available to suite our taste, and general advice invaluable throughout our selection process. When the time came for installation of the kitchen, your efficiency and punctuality was greatly appreciated. Thank you for your professionalism and expertise in craftsmanship. We would be happy to recommend your services in the future. I am delighted with my new kitchen and appreciate the time and effort put in by Craftbuilt employees to ensure that the kitchen was everything I had anticipated… 17 years ago Craftbuilt had built the kitchen that was removed and in a testament to the quality of that workmanship I was able to on-sell the old kitchen to the first person to enquire. We would not hesitate recommending your company to anyone who is looking to replace their kitchen or install a new kitchen with no hassle whatsoever. I love my new kitchen! There is absolutely nothing that I would change! My sincere thanks go out to all involved with the creation of it. The skilled workmanship of all men and women involved in manufacturing and installing the kitchen is to be commendable. We wish to take this opportunity to acknowledge the expert craftsmanship of all trades people involved in the construction of our kitchen. The cabinet work and installation is first class as is the granite bench tops. The work of all other trades people (plumber, electrician, plasterer and tiler) was also expertly completed and they were also considerate and a pleasure to deal with.